After losing his wife and children in the Civil War, Shad Parker relocated to Gilead, Texas and planted a DO NOT TRESPASS sign on his land and his heart. Enter the Coats Children. When he grudgingly saves their lives, he's stuck taking them in. The Kerrigans have fought long and hard to carve out their own piece of heaven on the Texas frontier. And when evil comes knocking at their door, with guns blazing, there'll be hell to pay . . .
Those were the last words uttered by a dying man who was the boomtown’s most recent sheriff. Rail-thin and half starved, desperate cowpuncher Jess Casey ignores the travel advice. Instead, Jess not only enters Fort Worth, he becomes the new sheriff, inheriting the body-riddled little slice of heaven called Hell’s Half Acre, the wide-open, deadliest piece of real estate on the American frontier. In 1881 Texas, Marshal Frank Mabry is faced with the most puzzling and dangerous assignment of his long career. The forty-two-year-old former Texas Ranger meets with representatives of the War Department and is told of a train robbery that occurred near Denver, Colorado, eight months earlier. $500,000 in government greenbacks and gold coins had been stolen, and two soldiers brutally murdered. All attempts by army and railway detectives to find the killers and recover the stolen money ended in failure. Then an army captain who had doggedly searched for the killers was found dead hundreds of miles from Denver, in a small Texas cow town. Had the captain unearthed a critical piece of information about the robbery but was killed before he could pass it along? The Secretary of War s top advisor, Hiram McDougal, wants answers. He is told the man for the job is Marshal Frank Mabry, a no-nonsense, relentless lawman who is familiar with the Texas country. Mabry quickly finds himself challenged with the job of not only finding the killers, but keeping himself and a greenhorn army lieutenant alive as well. Along the way, Mabry encounters a mysterious ranch foreman who is hiding a dark secret, a beautiful dark-haired saloon owner out of his past, and a passel of violent men who kill for the mere pleasure of it. When Indians massacre an army troop, Ross Caldwell's wife fears he's among the victims. But Caldwell is on the run, pursued by bitter enemies from the Civil War. They risked their lives to make a home in the heart of West Texas. Now the Kerrigan family must face the deadliest challenges of the land they love—and the evil that men do. COME HELL OR HIGH WATER . . .
During the bloody Apache Wars, Trap O'Shannon, Clay Madsen, Ky Roman, and a few others distinguished themselves with uncommon valor in the brutal Geronimo Campaign. Known as the Scout Trackers, this fearsome bunch of battle-hardened warriors rode hard, shot straight and plenty, and took chances no one else was willing to take. But times have changed and the brotherhood is scattered here and there in a changing land--until the past comes rolling back with a vengeance. Reunited, the gang is ready to ride hard from Montana all the way to the Arizona Territory to enforce their fearless brand of justice. Killers of every stripe will stand in their way, but that only means Trap and his men will fight that much harder to bury every last one of them . . .
Leaving their Pennsylvania home to forge a new life in the untamed Oregon Territory of 1845, the Colter family is ambushed by a kill crazy gang of cutthroats on the Oregon Trail. Fifteen-year-old Tim Colter manages to escape and hide--only to return and find his parents butchered, his sisters Nancy and Margaret missing, and one last killer waiting for his return. "STAY THE HELL OUT OF FORT WORTH." Those were the last words uttered by a dying man who was the boomtown's most recent sheriff. Rail-thin and half starved, desperate cowpuncher Jess Casey ignores the travel advice. 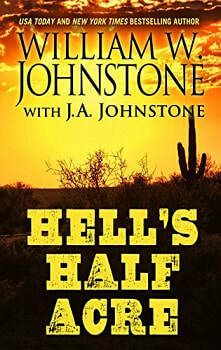 Instead, Jess not only enters Fort Worth, he becomes the new sheriff, inheriting the body-riddled little slice of heaven called Hell's Half Acre, the wide-open, deadliest piece of real estate on the American frontier. Wrongfully accused of murder, Dr. Catherine Bennett is destined to hang... unless she can disappear. With the untamed territory of Colorado as her most likely refuge, she packs her physician's kit and heads West. But even with a new life and name, a female doctor with a bounty on her head can hide for only so long. Sawbones is the first novel in a gripping historical fiction series. Civil War soldier. Trail driver. Cattleman. Texas Ranger. The story of John Horton Slaughter is the story of the America West itself. Now bestselling authors William and J.A. 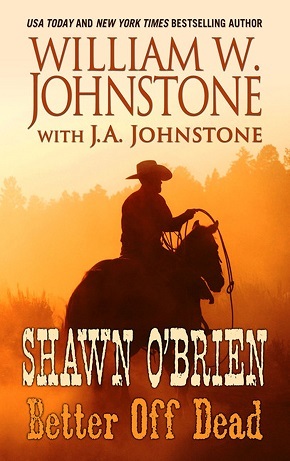 Johnstone bring this legendary figure to life in the blazing saga of the first sheriff in U.S. history who could tame a town like Tombstone, Arizona. A WESTERN LEGEND. AN AMERICAN HERO. It s been barely a decade since the notorious gunfight at the O.K. Corral. Rustlers and outlaws still terrorize the land, and the good citizens of Tombstone are at the end of their ropes. Enter Texas John Slaughter the new sheriff of Cochise County and the toughest lawman west of the Rio Grande. With a backbone of steel to match the iron law of his badge, Texas John is determined to bring peace to this parched desert hell even if it kills him. Which it just might. When word gets out about an untapped vein of silver in the Dragoon Mountains, every man in town heads for the hills. The streets of Tombstone are an easy target for raiders, looters and one gang of outlaws foolish enough to kidnap Slaughter s young, pretty wife. At the end of Mark Twain's Huckleberry Finn, on the eve of the Civil War, Huck and Tom Sawyer decide to escape "sivilization" and "light out for the Territory." In Robert Coover's Huck Out West, also "wrote by Huck," the boys do just that, riding for the famous but short-lived Pony Express, then working as scouts for both sides in the war. They are suddenly separated when Tom decides he'd rather own civilization than leave it, returning east with his new wife, Becky Thatcher, to learn the law from her father. Huck, abandoned and "dreadful lonely," hires himself out to "whosoever." He rides shotgun on coaches, wrangles horses on a Chisholm Trail cattle drive, joins a gang of bandits, guides wagon trains, gets dragged into U.S. Army massacres, suffers a series of romantic and barroom misadventures. He is eventually drawn into a Lakota tribe by a young brave, Eeteh, an inventive teller of Coyote tales who "was having about the same kind of trouble with his tribe as I was having with mine." There is an army colonel who wants to hang Huck and destroy Eeteh's tribe, so they're both on the run, finding themselves ultimately in the Black Hills just ahead of the 1876 Gold Rush. Born a slave on an East Texas cotton plantation, Clay Little Bull was captured by the Kiowa as a small child and raised among the tribes. But at 20, he left the only home he'd ever known and began a journey in search of freedom. Now, an outcast among whites, blacks, and Indians, Clay comes face to face with the hypocrisy and lawlessness that rules the West--and draws first blood when he escapes from a band of Kansas slave hunters. Six months ago, Ellie was a newlywed, working the dry land in 1880s Texas. Then the desperados came. They raped her and killed her husband, leaving her for dead. But she hunted them down and, along the way, found an inner strength and relentless determination that no man can match. Ellie thought the killing was over...that she'd put her guns away for good to run a ranch that she'd inherited from a legendary Texas Ranger. She was wrong. A prison wagon is on its way to Huntsville when one of the prisoners, ruthless killer Angel Ware, engineers a bold escape. Now free, and blaming his sister Sue for his arrest, Angel and a gang of three other escaped murderers track her and her family down to Ellie's ranch. Angel and his gang mount a bloody attack and take Sue's young child with them. There's a posse on its way, but Ellie Taine isn't going to wait. She saddles her horse and loads her guns, prepared to enforce the only justice she can rely on...her own. From bestselling authors William W. Johnstone and J.A. Johnstone comes a blazing new saga of Duff MacAllister. One man, forging a destiny. One legacy, sworn to justice. One name, branded in the heart of America. . .
On a bloody day in 1887, death came to Blanco, Texas. Before the sun went down, the livery stable was torched, an outlaw gang robbed the bank, two men were killed, and young newlywed Ellie Taine was raped. One of the dead was the man who planned the robbery - the son of dying, legendary Texas Ranger Jonathan Crossland - the other was Ellie's husband, an innocent bystander. The dead don't know fear. From the great-grandson of famed U.S. Marshal Rooster Cogburn comes an authentic new "True Grit" Western classic. With a bag full of gold dust, Newt "Widowmaker" Jones is set for life. Then he makes his first mistake, trusting a cheerful stranger. By dawn the stranger--Javier Cortina, the son of the famous Texas border bandit, Juan "Red" Cortina--is gone. So is the gold. 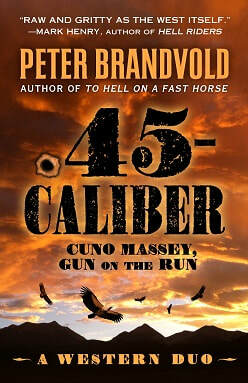 So are Newt's horse and even his fearsome Colt .44. It's enough to make a man want vengeance. And vengeance will be Newt's. "In this brilliant series from national bestselling authors William W. Johnstone and J.A. 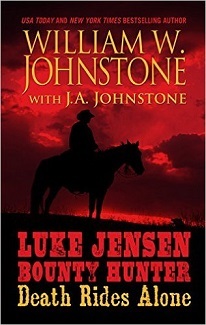 Johnstone, Luke Jensen, reported killed during the Civil War, comes back with a vengeance to forge his own legend in a violent, lawless land." What started as a routine hunt and grab putting outlaw Thorp McCluskey on a train to Cheyenne and prison has just gone straight to hell for bounty hunter Luke Jensen. First came the beautiful prostitute who pointed her alluring attentions in Luke s direction. Then came a man who fought by Luke s side in the war but the war is over and friendships can turn deadly. Luke gets bushwacked, his prisoner is gone, and so is a fortune in gold. Haunted by memories of the Civil War, Coy Jennings just wants to find work as a ranch hand and to begin saving for a small farm where he could finally enjoy peace and quiet. 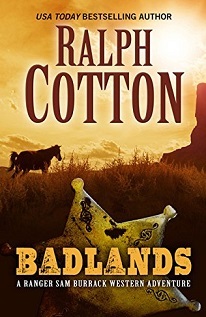 Arriving in the Texas settlement of Phantom Hill, Coy soon befriends a damaged but likable stable hand by the name of Ira Dalton and hopes for a future with a lovely widowed mother and her eight-year-old daughter. From America's bestselling Western authors comes the frontier legend known as the Town Tamer: the man who appears when justice has fled.